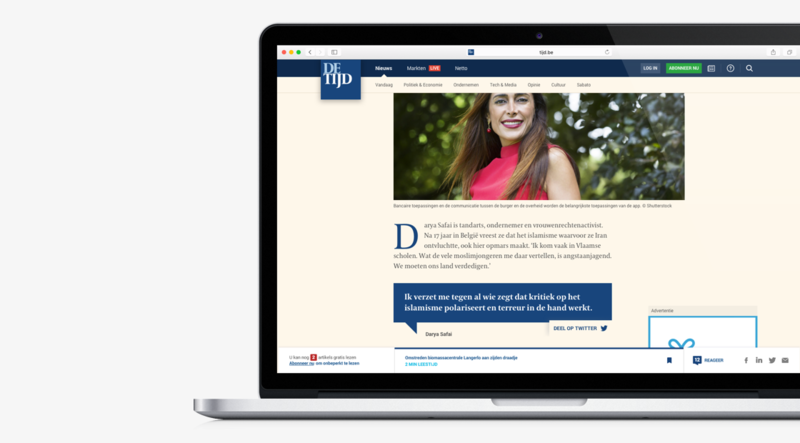 De Tijd is one of Belgium’s most successful newspapers. It has won numerous prizes, both for design and for reporting. The brand combines generic news coverage with a strong focus on the financial markets and public policy making. November Five and Mediafin took up the challenge of translating this strong and versatile brand into a smooth, accessible and user-centric online experience. Consuming news in a digital context is no easy feat. As a user, you’re constantly bombarded by advertisements, news updates and breaking news items. As a result, it's easy to get lost in a frenzy for your attention. 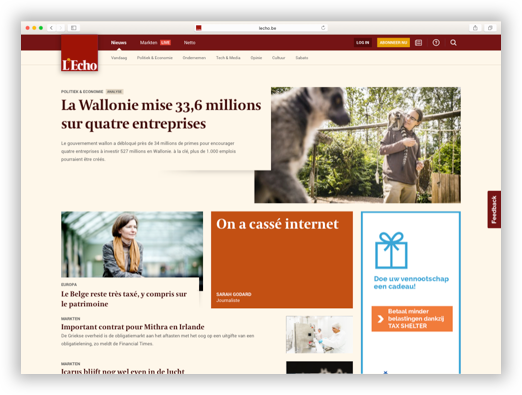 In today’s online news experience, a conscious choice for focus and simplicity is a unique selling point. Why? Well, because we are dealing with a lot of stakeholders. These include advertisers, the editing staff, the editor-in-chief and the marketing department. Each of them wants the reader’s attention. Balancing the push of those stakeholders’ interests with the pull of the user’s needs has never been more important. It’s exactly that balancing act that is at the core of the assignment we did for DeTijd/L’Echo. 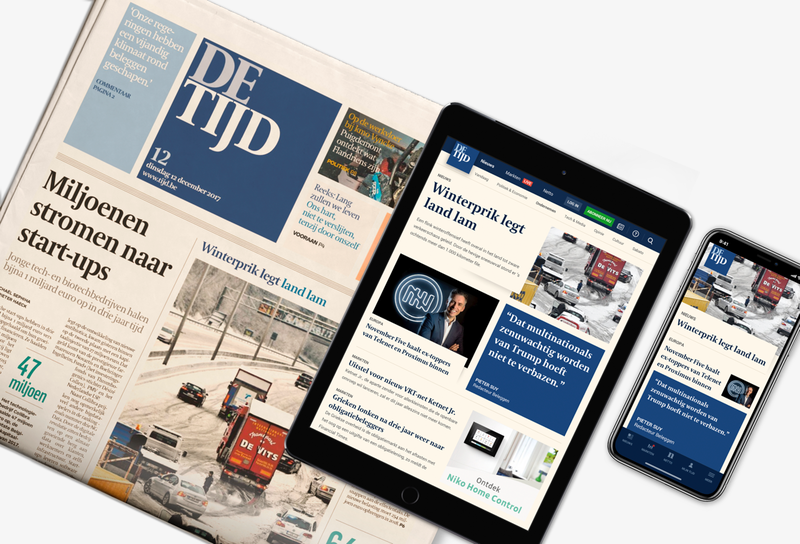 In order to position De Tijd/L’Echo as strong digital brands, we need to make sure their storytelling stands out. Today, news sites tend to hurl an overload of information at the reader. So to get the narrative across, we need to invest in a platform that keeps the cognitive load on the page low. The key is to actively choose simplicity over complexity each time. De Tijd/L’Echo has a very diverse reading audience. It ranges from more generic news readers to readers interested in specific industries to investors who are looking for news on their portfolio. Each of these profiles needs to have a great experience. Additionally, individual users approach the news with different mindsets depending on the time of day. The new DeTijd.be needs to take all of these factors into account. Ads can compromise the reading experience. They tend to be positioned willy-nilly on the page, with little regard for the content that they are blocking. However, they are a crucial part of the revenue strategy of any site. 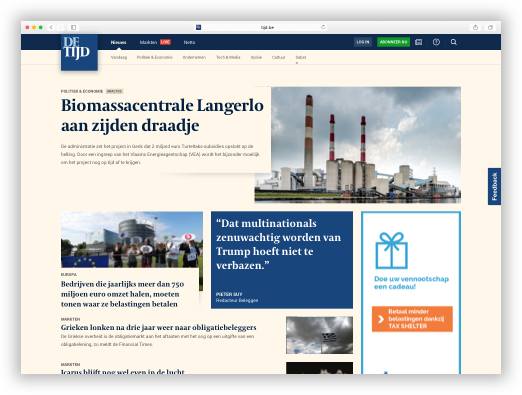 So as opposed to treating advertising as an afterthought, we have taken an advertising-first approach towards defining the websites for De Tijd and L’Echo. The user wants to skim the news to discover the main items. The user has a specific, long-term topic or area of interest in mind that he/she wants to research. The user is looking for a practical solution to a question he has right now. It’s all about identifying the moments when there can be a valuable interaction between the brand and the user. The key question is (or should be): “how can we facilitate the user’s needs at any point in time”. To answer that question, we looked at a number of moments in a standard day. 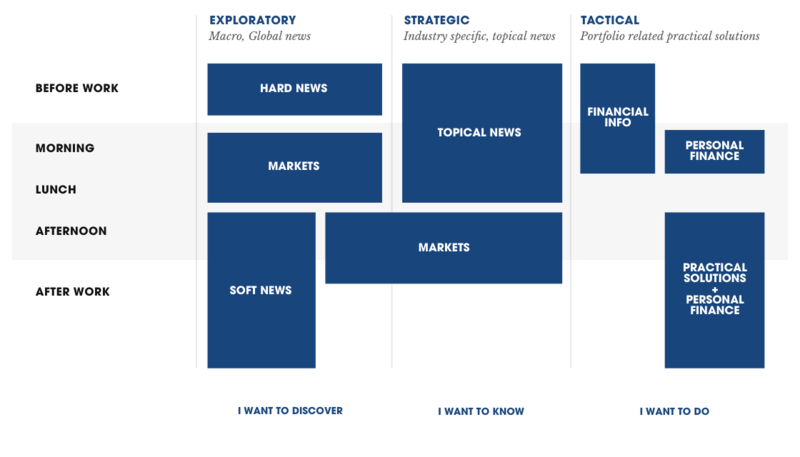 For each of those moments we identified which type of news is likely to be the best fit for the user, depending on his/her mindset. For example: when I wake up, I want to make sure I am up-to-date with the news. I am looking for an overview of the news facts, no frills. This is the exploratory mindset, looking for “hard news” before work. The first step in shaping the experience was defining the information architecture (IA). The IA determines the way we structure the information to align with the strategy. To match our three mindsets, we started with the single most important component on the website: the navigation. We needed to define the paths a user can follow to reach the information he/she needs. Three items in the navigation facilitate this moment: “vandaag”, “markten” and “netto”. Each of these items link to overview pages that provide hierarchy and top-level information. The secondary navigation is the go-to level for users looking for information on specific topics. The categories covered here are politics, tech, media, etc. Two sections of the navigation should facilitate the more practical user’s mindset: the search and the services provided under “Mijn Tijd”. The online news consumer is one tough cookie. He wants to be able to read on each screen, whenever, wherever. We defined a set of components that can provide an optimal experience on each available screen size. We have an obligation to our readers to guide him/her through a text. Using different designs and styles to create visual keys, we create structure and hierarchy. We introduced an optimal line length of 50-60 characters per line. We avoid lines that are too long as they make it difficult for readers to gauge the beginning and end of a line. Lines that are too narrow tend to put stress on the actual act of reading. Readers start the next line too soon without having finished the previous one. The new website in an exercise in focus, opting for a balanced read devoid of clutter. Clarity over clutter. Investing in a clear user experience that translates into a balanced user interface. Designing for different user profiles and user intents with an eye on retrievability. To create a more dynamic reading experience we combined 2 streams of content. A recency and priority based stream captures how the news moves minute by minute throughout the day. A second ‘Serendipity’ stream inserts content the newsroom wants to allocate for a longer time on the homepage. Both streams flow between fixed blocks of content and advertising spaces. To lower the cognitive load of the homepage and create a perception of overview, we set out to define a small but flexible component set to display content. This allows a user to focus faster on specific content types, increasing the scannability. We’ve only just scratched the surface of creating an end-to-end digital news experience! Now that we found that balance of push and pull, we’ll be zooming out, next. In the following releases, we’ll assess the user’s full lifecycle, from acquisition to retention.